Microsoft is bringing its Outlook email program to Windows 8 RT in a bid to expand the availability of Windows tablets based on low-power ARM processors. Outlook will be included with version 8.1 of Windows RT, previously dubbed Windows Blue, Microsoft announced at the Computex trade show in Taipei on Wednesday. The 8.1 update is scheduled for release later this year as a free update to Windows 8. "We're always listening to our customers and one piece of feedback was that people want the power of Outlook on all their Windows PCs and tablets," Microsoft said. Windows has traditionally run on x86 type processors such as Intel's Core chips, but most popular smartphones and tablets, including Apple's iPad, are based on low-power ARM chips from the likes of Qualcomm, Samsung and Nvidia. With the release of Windows 8, Microsoft also offered Windows RT for devices with ARM-based processors, a move to help it compete better with Apple's iOS and Google's Android. Support for RT from hardware makers has been limited, however, with several PC makers, such as Acer, Asustek Computer and Hewlett-Packard, not yet supporting the OS. Microsoft hopes to change that by addressing one of the criticisms of Windows RT -- that it doesn't include a version of its popular Outlook email client. Nvidia CEO Jen Hsun Huang has been vocal about the importance of adding Outlook to RT. "If Outlook were to show up on RT, my life would be complete," he said recently, lamenting the slow sales of Windows RT tablets. "I am one Outlook away from computing nirvana. Outlook god, please..."
His prayer has apparently been answered. Outlook will now join Word, PowerPoint, Excel and OneNote in the suite of Office apps bundled with RT devices. Microsoft also announced that it will include Word, Excel, PowerPoint and OneNote "in the box" with the x86 version of Windows 8, to enable more affordable price points for x86 Windows tablets. The list of bundled apps for the x86 version apparently does not include Outlook, however. 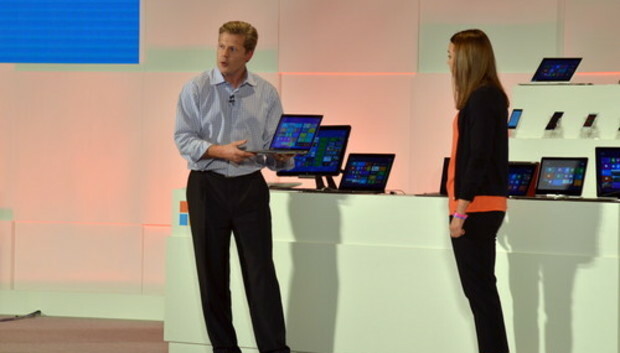 It remains to be seen how much the change will boost sales of Windows tablets. Some users were jolted by the big changes in Windows 8, including its Metro interface, and Windows 8.1 is a move by Microsoft to address to those criticisms. The Windows 8.1 update for x86 PCs is also due later this year. Microsoft has said it will deliver a preview version of Windows 8.1 at its Build conference later this month.